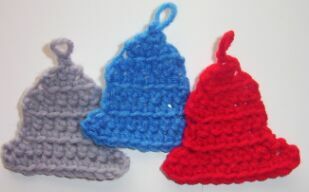 Just like the original Christmas bells, these crochet Christmas bells only take a small amount of yarn and are quick and easy to make. Perfect to use as accents for any of your other craft projects. Row 1 - Ch 1. Skip 1st chain from hook. 3 sc in 2nd chain. Chain 1. Turn. Row 2 - 2 sc in first sc. Sc in next sc. 2 sc in last sc. (5 sc) Chain 1. Turn. Row 3 - 2 sc in first sc. Sc in next 3 sc. 2 sc in last sc. (7 sc) Chain 1. Turn. Rows 4, 5, and 6 - Sc in each sc across. Chain 1. Turn. Row 7 - 3 sc in first sc. Sc in next 5 sc. 3 sc in last sc. (11 sc) Chain 1. Turn. Row 8 - Sc in each sc across. Chain 2. Slip stitch in same space. Fasten off. Create a loop at the top of the bell. Weave in yarn ends.